Vanities. 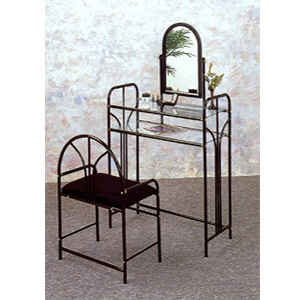 Art Deco Style Vanity Set In Glossy Black Finish With Two Storage, Clear Glass, Rectangular Shelves And Matching Stool With Padded Seat In Black Velour Cover. Strong Construction. Easy To Assemble. Details: Vanity: Width: 29 In. x D: 13-1/4 In. x Height: 51 In. Stool: Width: 19-1/2 In. x D: 13-1/2 In. x Height: 22-1/2. In.